Myron J. Smith is the author of eight books that provide readers with some of the Civil War naval literature's most in-depth treatments of the men and machines that prowled the country's western inland waterways. With research drawn from this earlier work as well as new inquiries into ocean-going vessels and their commanders, Smith's ninth and latest publication Ironclad Captains of the Civil War is a robust biographical register of naval officers who commanded steam-powered ironclad warships and floating batteries during the conflict. 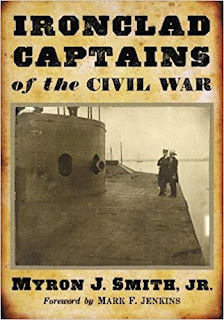 The second reference book to his credit (the other being 2015's Civil War Biographies from the Western Waters), Smith's Ironclad Captains of the Civil War explores the lives and career resumes, though much more the latter, of 158 Union and Confederate naval officers. As one might expect, while each entry follows a similar format some are more detailed and have richer available source material than others. For each officer, important dates (ex. birth, death, academy graduation, promotions, etc.) are duly noted and brief family background and professional education information provided. Where applicable, discussions of antebellum, Civil War, and postwar naval careers are offered. The names of ironclad vessels commanded are helpfully printed in boldface and those particular command histories constitute the primary focus of each mini-biography. If a captain had a modern USN vessel named in his honor, that fact is mentioned at the end. Positioned at the very bottom of each biographical sketch is Smith's list of sources consulted. These consist of a variety of primary and secondary materials and biographical resources of all kinds. They might include the OR, ORN, and other government documents and publications along with books, periodicals, newspaper articles, digital sources, local histories, and more. The book also has a full bibliography and index. Additionally, the volume is well illustrated, with images of the captains dutifully accompanying most biographies and photographs of many of the ironclads they commanded also included. Most ironclads had more than one commander during the war so Smith created an appendix that lists alphabetically underneath each vessel heading its serving captain(s). It appears that the Benton and Carondelet tied the record for most captains at nine each. It's a useful appendix but might have been even more so had the captain lists been arranged in order of service (with dates included) rather than alphabetically. At first glance the list of Union ironclads in the appendix is clearly undercounted, but Smith appears to have intentionally left out of consideration the great many Monitor-descended ships and classes (particularly the most advanced ocean-going types) that were either in construction or launched during the war but were commissioned and went into service after the conflict terminated. An authoritative biographical compilation, Ironclad Captains of the Civil War is quite a handy guide and deserves a place in the naval research sections of institutional and home reference libraries alike. profit-making but publishers are pushing readers away.